Anybody can roll fingerprints. No license or special certificate is required to fingerprint somebody. 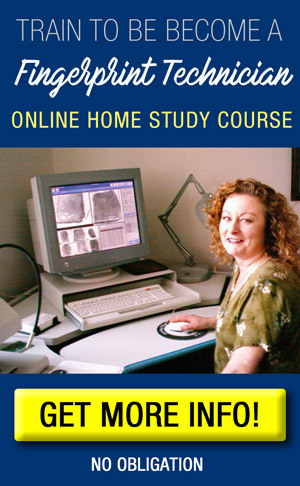 You simply need the correct ink and materials, and be instructed how to roll the fingerprints in an acceptable fashion. Do not use regular ink pads!! This type of ink is not of sufficient quality for obtaining fingerprints. The results will be too smudgy and light, and will not yield much benefit. The best ink to use is regular printer’s ink in a tube. Squirt some out onto a smooth surface such as a piece of plexiglass, this will be your inking plate. Use a brayer to roll the ink evenly on the surface. Be careful, a little goes a long way! 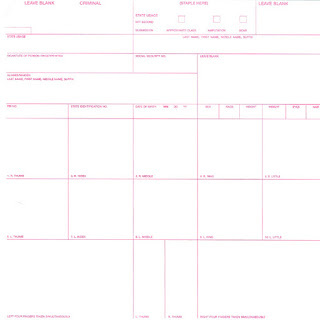 Once the ink is rolled out to a size of about 4″ by 6″ you are ready to obtain fingerprints from your subject. Associate yourself with the fingerprint card you will be using. 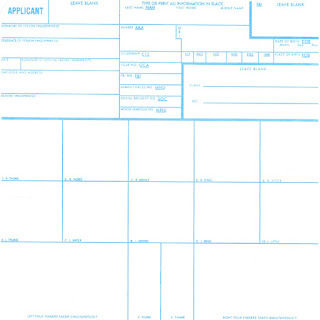 Most agencies use the blue card for applicants, and the red for criminal justice purposes. Learn what number each finger is. The small boxes in the middle of the card will be for rolled impressions. The spaces at the bottom of the card are for flat impressions. Always start with the rolled impressions, and start with finger #1. Hold the subject’s right thumb in your right hand. Roll the thumb in the inking plate from nailbed to nailbed. Then roll the inked thumb on the fingeprint card starting from one nailbed and ending with the other nailbed. Thumbs are best rolled towards you, and fingers away from you. This is the easiest technique and places the least amount of stress on the fingers of the subject. Repeat with fingers 2 – 10. Be sure not to re-use the inking plate where you previously inked a finger. This will lead to double impressions. If you run out of room on the inking plate, re-roll the area with the brayer to get a fresh coat of unused ink. After the rolled impressions are finished, begin with the flat. Again, ink the subject’s fingers and place them onto the card in the spaces alotted. The right 4 fingers will be places together in one inking. Same with the left 4 fingers. For the thumbs, each will be inked separately and not rolled! These are flat impressions. 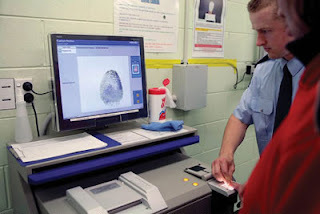 A much easier, and less messy, way to obtain fingerprints is through LiveScan equipment. These inkless machines use a glass platen to read fingerprint impressions in just a few seconds. The fingerprint are saved electronically and can be printed or sent through an electronic fingerprint database system (AFIS). The procedure is much the same except without ink. The fingers are rolled in the same order, starting with the rolled impressions, and then the flat impressions.